Nature Exuding Radiance and Joy in Homa Atmosphere. 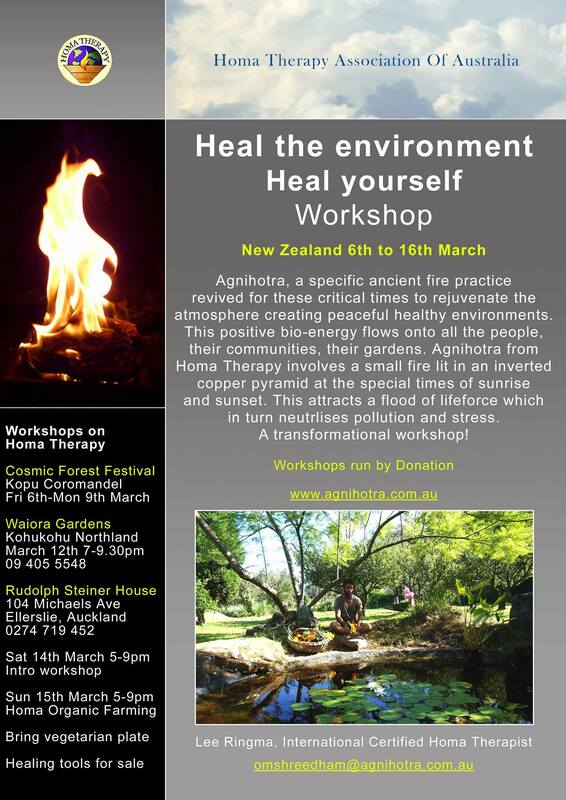 Homa Therapy workshops will be conducted in New Zealand during March, 2015. Workshops will be facilitated by Lee Ringma. We all long to live in healthy peaceful abundant environments. Homa Therapy from ancient knowledge can create just this with a simple practice that even children can perform. Lee Ringma is an inspiring speaker with 25 years experience, sharing this information. You will also have direct experience of this transformational practice to equip you to apply this to your own environment if you wish. We highly recommend you come to these 2 only free workshops for New Zealand; Waiora Gardens, Kohukohu, Northland and Ellerslie, Auckland. An Agnihotra tour and Homa Therapy workshops were held in Victoria in early May. Maryann Billian from the Baltimore Homa Community in the U.S. and Joshua Hoare, Agnihotri from Melbourne assisted Lee on the tour. It was lovely to share the experience, always highly inspiring and enriching. Over the years we have had many people passing through Om Shree Dham, Homa Therapy Centre here in the Hunter Valley, NSW. Some people who are sensitive to the radiation of high voltage power lines have noted with surprise that our Fire Hut is positioned right under an electricity power transformer. However, on going inside the hut, all have commented that they do not experience any electromagnetic field distortion.